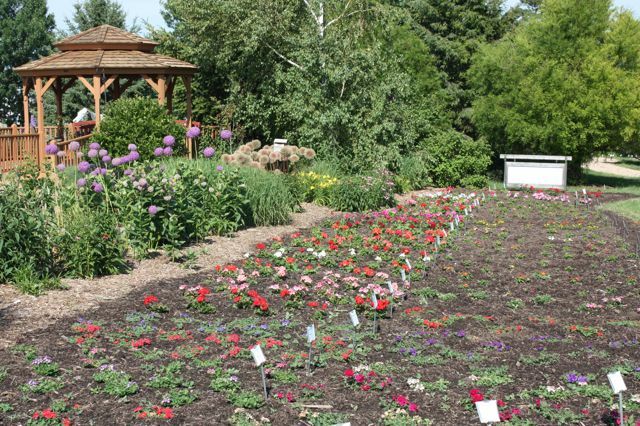 The Verbena, Lantana, and Geraniums in this picture are a few of the 388 cultivars of flowers being trialed this year. The University Display Garden is planted and freshly mulched. This year we are trialing a total of 388 cultivars of annual flowers and approximately 127 varieties of vegetables and other food crops. With the help of irrigation the plants are settling in nicely. We continue to hope for rain. Please come and see our selections grow throughout the summer. This entry was posted in Plant Development and tagged annual flowers, Annuals, colored foliage on annual plants, Dane County, educational programs, flowers, gardens, Home gardener, madison, new, New annuals, plants, University Display Gardens, variety trials, vegetable trials, vegetable varieties, vegetables, wisconsin by bemerson. Bookmark the permalink.